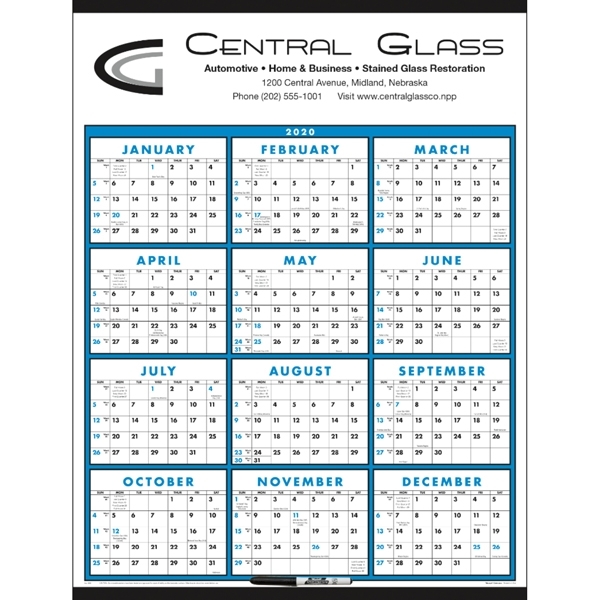 Span-A-Year - Laminated with Marker 2020 Calendar. See the entire year at a glance for convenient planning. Tinned at the top and bottom, this handy calendar is in a span-a-year format. The surface is a write-on, wipe-off, UV-laminated surface. Grid blue matches Process Blue. Top markets: manufacturing, retail, construction. Material: 100# gloss text. Product Size: 22"w x 29"h.
Size: 22 " x 29 "
Ship Weight:Shipments are sent prepaid and billed to the distributor unless your order requests otherwise. Freight charges are added to the customer invoice at published rates. Price Includes: for one-color (black) imprinting. Insert & bind sheet supplied by advertiser. Please contact factory for specifications if supplying preprinted sheets. Standard minimums (100) apply.